Most of us are flat out feeding, cleaning and caring for our babies and squeezing in the occasional shower for ourselves. But a new book claims we should be teaching our a babies to talk from the time they are newborns. 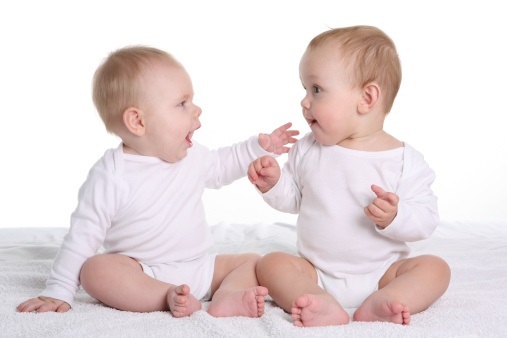 The book is Small Talk: Simple Ways To Boost Your Child&apos;s Speech and Language Skills From Birth. It is written by British authors speech therapist Nicola Lathey and mum Tracey Blake. Tracey came up with the idea for the book after watching her friend Nicola have a &apos;conversation&apos; with her ten-week-old daughter Minnie. Nicola would make eye contact with Minnie and make a noise, then wait for Minnie to make a similar noise and so on. Nicola claims you can improve your baby&apos;s language skills in just ten minutes a day. Tracey followed the advice diligently and says her daughter Minnie was speaking in full sentances from 18-months of age. Minnie is now three-and-a-half and has the language skills of a five-year-old. Tracey told the Daily Mail, "She&apos;s always telling us about her imaginary adventures running a nursery &apos;with lots of kids&apos; in our conservatory, going on holidays to Spain, fitting shoes in a shop and working as a waitress in a busy cafe which she finds &apos;exhausting&apos;." Tracey says her son Monty who has just turned one is progressing at a rapid rate too. The "norm" for most children is twenty disconnected words by the age of 18-months. Just in case you aren&apos;t convinced, Professor Sue Roulstone of the Speech and Language Therapy Research Unit for North Bristol Trust says children with poor communication skills are more likely to become youth offenders adding that parents really should give their children &apos;the gift of conversation&apos;. So wipe that spew off your top and get busy mum. Time&apos;s a wasting. Have fun! – don&apos;t be pushy, keep it light and enjoyable.